The brochure printing may have a very important role in the process of selling, activated by a company. For this reason, the brochure printing proposed by Graffietti uses the most innovative technologies in order to obtain an impeccable graphic yield. The printing service brochure can be required for various types of brochures. Our printers, experts in brochure printing, will be able to achieve elegant brochures of presentation for you, in plasticised, painted, shiny or opaque material, in a wrinkled traditional way or in a cross way. You can also choose the kind of printed matter that best suits your needs: hot printing or relief in dry-stone. 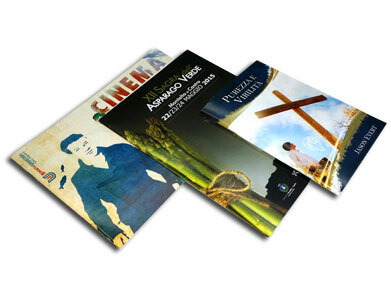 Get a quote and we will be happy to provide more detailed information about all of our brochure printing services. A brochure is an informative leaflet that explains in detail the distinctive characteristics of a company and the goods or services it introduces in the market. Therefore, the brochure print has advertising purposes, and for this reason it requires some attention in graphic design and tonal control about the production of images. The printing-lithography Graffietti proposes an exclusive service of brochure print, using the most innovative existing technologies. In particular, for brochure print Graffietti relies on the “sublima”, the last technological idea by Agfa, the world leader in the field of photography and prepress. For printing advertising brochures, Graffietti has the last generation technologies that improve the result of images and photographs. To this You have to add the attention to detail in additional working, in the possibilities of different folders or “cordonatura”, in the choice of the paper format. Therefore entrust in Graffietti for printing brochures means to put to your disposal vast opportunities for the creation of a brochure perfectly relevant to your needs. Elegance, attention to detail, high quality materials and great specialisation: this is the added value that the printing-lithography Graffietti offers to all customers who need print brochure service. or cheapest so-called “autocopertinati” of unique grammage. Additional processing cover: glossy or matte lamination, UV coating glossy, matt or gloss UV coating zone, Laminated or with hot embossing.